It’s always great when you can manage to free up some money by being able to reduce your monthly budget. A simple way to cut down expenses and save money is by living frugally. 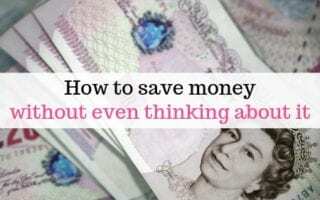 Living frugal has become more of a priority for us lately; it means I can stay home with our children while they’re small, it’s helping to save more money which will help pay off debt quicker, which in turn will improve our finances in the long term. What does it mean to have a fugal lifestyle? sparing or economical as regards money or food. So frugal living is simply about being careful with your money, knowing where it goes, and finding ways to spend less. You might think that frugal living is boring. Or too limiting perhaps. It doesn’t have to be! 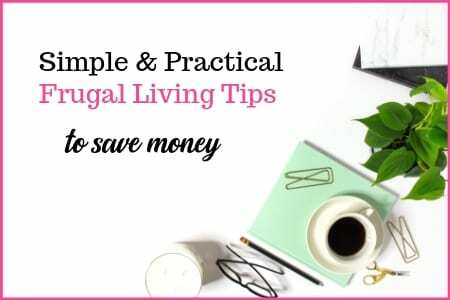 Actually, it can be pretty simple to just change a few habits or products and once you’ve got into the swing of it, living frugally wont even seem like a challenge anymore – it becomes second nature. Those savings that you make all add up over time and can be used to fund things that might not have been affordable before, like days out or even a holiday. You don’t have to be a cheapskate or tightwad to live frugally. You just have to be more intentional with your finances. For example, being frugal wouldn’t necessarily mean you stop donating to a charity you support – if you decide that giving is a priority, then you might look for an area that’s less important and make savings there, perhaps cancelling a gym subscription or buying less take out. 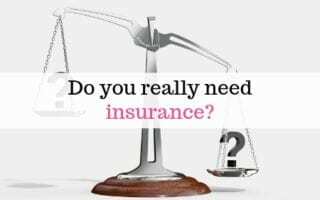 It doesn’t mean not being able to do anything or having to say no all the time either – if a friend invites you out for a meal, you can still go but be more frugal about it – perhaps suggest a less expensive restaurant, or just buy a starter. Or even invite them to your home for a meal instead. 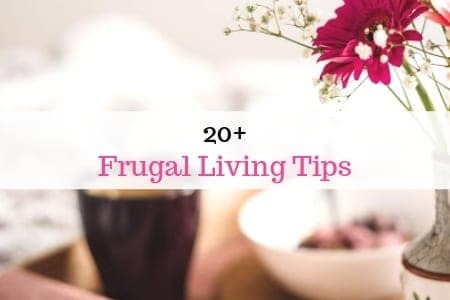 There are so many ways you can be a little more frugal in order to make some extra savings; I’ve rounded up some of the best frugal living tips that provide simple ways to save money at home, on the move and with your grocery shopping. You don’t have to take living frugally to the extreme, although there are some amazing weird and wonderful measures that some incredibly frugal people take – for example, have you heard of ‘family cloth’? It’s reusable cloth toilet paper, and something that in all honesty, despite the massive savings, I just don’t think I could get on board with, but kudos to those that do! Assuming the lights are on for about 4 hours per day, you’ll save about £11 per light bulb per year. My kitchen has 10 spotlights – that’s £132 saved in my kitchen alone! This sounds so simple, but if you have kids anything like mine, you’ll know it’s near on impossible to get them to remember to switch off the lights! We’ve got a timer on some of our lights now, so they go off automatically. You could try using a shower timer or choose a water saving shower head. If you have thermostatic radiator valves you can set the desired temperature for each radiator, but it’s also easy to just switch off the radiators in rooms not being used to save wasting heat. This one sounds pretty obvious but it’s surprising how many people don’t do this. Put on a jumper or layer up before turning up the heating. Get one of these squeezing tools to make sure you use up all the product in tubes such as toothpaste. You don’t have to give up TV entirely to give up your licence. Check out my post here about living without your TV licence and if you actually need one. When it’s time to replace appliances, choose ones with the best energy efficiency ratings. The price is usually only slightly higher, but the cost of energy you will save over the years of use make it a good money saving investment. I find that a quick check each year when it’s time to renew usually means it’s cheaper to switch. You can often find good cashback deals for these kinds of providers too. If you’re not signed up to cashback sites, check out this post about using cashback sites.I’ve had hundreds of pounds in cashback over the years, most recently we got £40 cashback just by switching our home insurance. We would have switched anyway as it was the cheapest policy available – so the £40 was a fab bonus just for a quick 5 second check on Quidco. Save money on expensive cleaning products by simply making your own – it works out cheaper and uses less chemicals too! 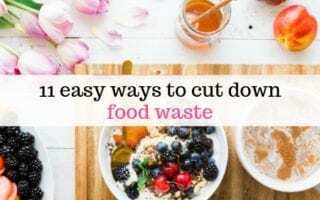 Create a meal plan, to avoid food going to waste and not buying unnecessary extras in the supermarket. See this post for easy ways to get started with meal planning. You don’t save to compromise on your diet either – it’s possible to still be frugal and eat well while spending less. Avoid the plastic bag charge by remembering to take bags with you when you go shopping. Keep some in your handbag or the boot of your car so you’ve always got some handy. Buying in bulk is usually cheaper, so if you’ve got space, it’s definitely worth it. 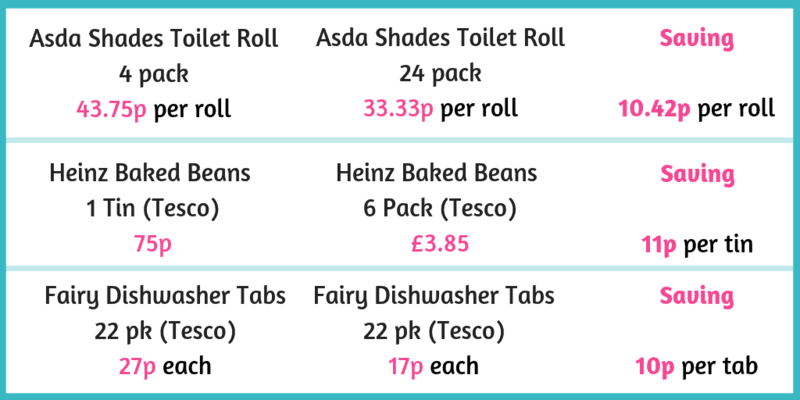 Things like toilet rolls, washing powder and other household essentials are often work out costing much less when you buy in bulk. If you have access to the internet, you can read the news on various websites for free. Similarly, live frugally by not spending money on books. You can make good use of your local library to borrow books for free. If you like reading eBooks, some libraries also have a eBook selection to borrow from, or you can get plenty of eBooks for free on Amazon Kindle books too. There are lots of apps you can add to your phone which give you freebies and cashback when you shop. Take a look at your grocery shopping and see what brands you buy. Then buy the next brand that’s less expensive and see if you either notice the difference, or are bothered by it. For example, we were buying Weetabix, and now buy supermarket brands ‘Wheat biscuits’. There’s not much difference in taste, but there’s a lot of difference in price. However, we tried buying supermarket brand baked beans, and I decided that the difference in taste wasn’t worth the saving in price, so I don’t compromise and carry on buying Heinz. Cola is definitely not the same as Coke or Pepsi, but my children don’t notice a difference between Robinsons squash and supermarket own brand. This is just a quick example of 5 branded products, the more brands you switch out, the more significant your overall saving will be. Start off by just switching one brand/price down – if it works out, you can always then repeat the process switching down again to the Smartprice/Everyday value etc ranges. 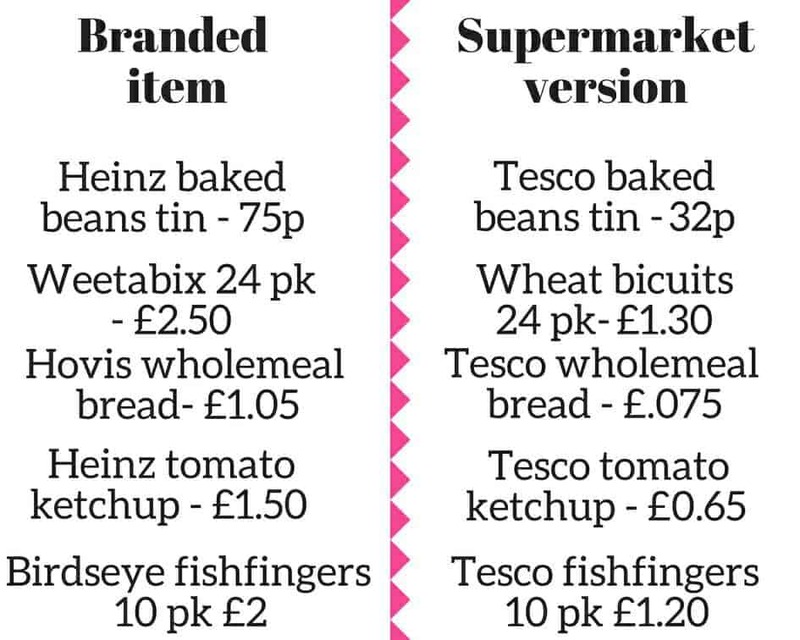 If you properly give this a go for all the branded products you buy, there’ll probably be at least a few things you’ll be happy with the downgrade on, and this could make a great saving on your grocery shopping month by month. Even basic foods like pasta come in a variety of brands and pricing. Give it a try and see what savings you can make – I’d love to hear how you get on. 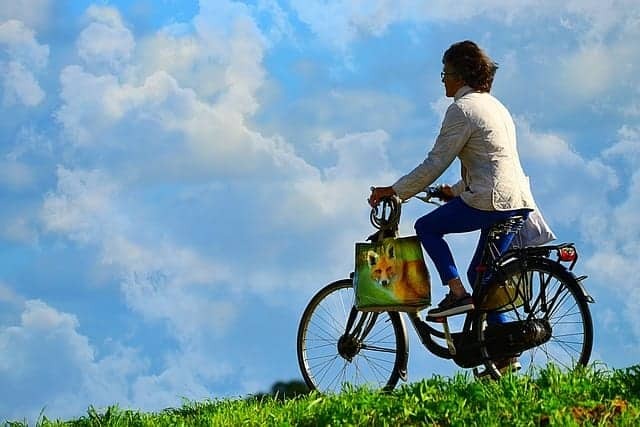 Walk or cycle where possible. This has the added bonus of keeping you fit and well as saving money. Take your own water bottle or even hot drinks flask with you when out and about to avoid getting tempted to buy expensive drinks.Avoid using motorway service stations for food, drink and fuel – you pay a premium. Try to avoid unnecessary braking, keep car tyres inflated to the required levels. This will save (only a little, but it all helps, right?!) on fuel costs. Also, don’t leave it until the last minute to fill up for fuel. If you’re desperate, you’re more likely to fill up somewhere more expensive. Consider if you could save the the cost of running an extra car by walking, using public transport or even living closer to your work. Don’t pay for things you don’t need to such as toll roads. Avoid paying the expensive toll charge (£5.50!) to drive on the M6 toll. If the traffic is clear -ie no accidents etc, the toll road is likely to save you only one minute! You can look on Google maps (if you’ve got someone with you!) to check the time of the journey with and without the toll.Think about it in terms of how much your time is worth – at a 1-minute time saving, your time is equated at being worth £330 an hour! A ten minute delay values your time at £66 an hour. At the National living wage, you’d need there to be more than a 42-minute delay to make taking the toll a cost effective choice. Budgeting is key, both to living frugally and managing your money in general. If you want to be in control of your money you need to make a budget. This is where you can work out the best places to make savings and adjustments and keep on top of your finances. Saving an emergency fund means you don’t have to panic and stress when things go wrong. Being prepared in advance for emergency boiler breakdowns, car repairs or needing a new washing machine, helps give peace of mind, as well as meaning you wont need to take on debt if that situation arises. Make paying off debt a priority. Living frugally is a great way to try and reach financially freedom, so if you have debt, the best and most frugal advice is to pay it off as soon as you can. The earlier you repay debt (in most circumstances) the less interest you’ll pay, so the more money you’ll save in the long term. Living frugally means living within your means. Use your budget to work out what you can afford, but if you don’t have the budget and can’t make room in the budget with a bit of rearranging, don’t spend what you don’t have. Still looking for more? Try this post from Rice Cakes And Raisins for 10 more ways to save money. Great practical advice on cutting costs! I’m a big fan of cashback too. I like using a cashback credit card too, so I get a bit of extra money back on all my shopping. Only a good idea if you’re sure you can pay off your bill in full every month, but I end up with an extra £90 or so every year, and I don’t even do much shopping! Thanks so much for taking part in #MondayMoney. Fantastic tips that cover so many areas of life – love it! I try to do a lot of these myself, and I’ve learned a lot over the years so I can safely say it becomes easier to be frugal with practice. Brilliant post! This was a good read! I think buying more plant protein helps the grocery budget too! Thanks for sharing! I like your brand switch experiment. For some brands, it makes a difference on taste or quality, but other things the difference isn’t there. There are so many ways to save money and live a better life. You have a great list to start saving and doing. In the last year I have cut our family grocery bill almost in half! Meal prepping and bulk really help. Thanks for all the other tips! So many great ideas for saving money. The little things really do add up! After getting tired of always reminding our kids to shut off the light when they left a room, we installed timers on them. If the kids forget, they at least shut off automatically! Oh that’s a great idea, thanks! My kids are the same! Great tips!!! Turning off the lights when you leave a room is a big struggle with my kids and husband. It’s a daily battle that I fight. Me too! My kids are constantly leaving the bathroom light on if they get up in the night. Great tips! I have one of those “squeezy” tools! Works well! I need to be better with meal prep! These are some great tips – some are so simple, and you wouldn’t notice much of a change – except that you’ll be saving, which is always good! Oooh I need the squeezing tool for toothpastes! I always just cut mine in half and use it that way. These are all great tips. I already do some of them, but a few of your ideas are new to me. I’m always looking for easy ways to save money each month!